Congratulations! You are going to have twins. Being pregnant with two babies at once can be a lot of work, but the reward is an exciting one. Once you find out that you are expecting more than one baby, you might believe that you have to dramatically shift your thinking about pregnancy. This is often not true. All of the healthy behaviors that you would do during a normal pregnancy still ring true in a multiple gestations. That said, in addition to normal pregnancy changes in lifestyle, there are a few other things that you can do to stay happy and healthy during your pregnancy. You've probably heard the expression eating for two. In a singleton pregnancy, you really only need about an extra 300 calories a day to grow a healthy baby. That's certainly not eating for two, despite the fact that you have yourself and baby to think of for nine months. In a twin pregnancy, that caloric recommendation goes up to about 3,500 calories a day total. That can be a lot of food. A twin mom-to-be needs to think about the average weight gain as being about 40-55 lbs. Weight gain early is also great because it can help impact the birth weights of babies, even those who come early. You might hear things like 24 lbs by 24 weeks, or even 25 lbs by 20 weeks. These are guidelines, but the point is, eat while you can. Later in pregnancy, you often lose your appetite because your abdomen is full of baby! Even then, protein shakes or fruit smoothies can help, even when you can't get much else down. Grazing is a way of life, particularly in the last trimester. 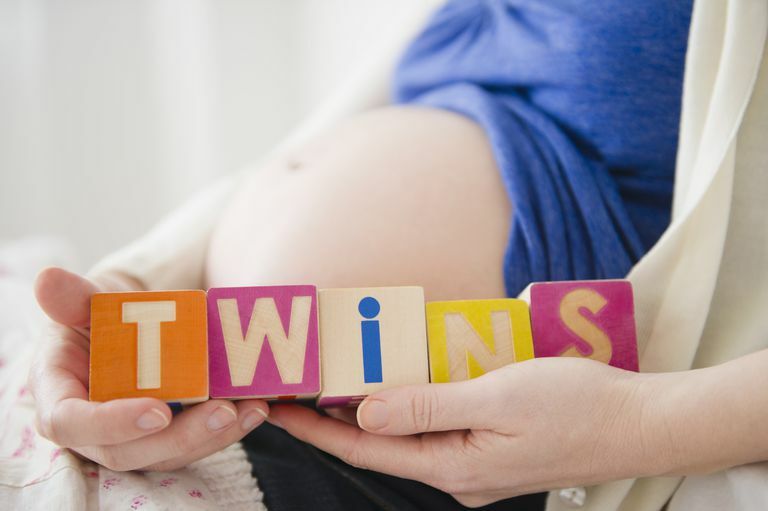 Moms who are pregnant with twins are often thrown into a high-risk pool. This can be frightening. High risk does not mean that something bad will happen to you or your babies. It means that you have a greater chance of something happening. The big things to consider are preterm labor, bedrest, and cesarean birth. Just how likely any of these are to come to fruition depends on many factors that are personal. This can be overall health, previous childbirth history, genetics, lifestyle and sometimes simply bad luck. Talk to other twin moms, but be careful. Choose the realistic but not overly frightening ones. Yes, there can be bad things that happen in any pregnancy, but you want someone who doesn't sensationalize it. Find a practitioner who answers your questions and knows when to call in a high-risk specialist, known as a perinatologist or maternal-fetal medicine specialist. You probably want to make an appointment to get to know your local high-risk specialist so that if you have questions, you know where to turn. Being pregnant is tiring, being pregnant with multiples is even more so. Early on, I'd recommend that you implement a rest period every day. Just get in the habit of taking a few minutes to lay still and be quiet. This is the perfect time to do fetal kick counts or just lay around and do nothing. And once you're in the habit, before you think you need it, it's normal by the time you do. I personally worked full time in an office when I had my twins. Every day after work, I'd come home and lay in bed for 20-30 minutes. This was hard because I had four other children. But we'd read stories or color; sometimes I'd simply nap. Everyone grew used to it and it was simply a part of our day. It was a blessing at the end when I was so tired and yet couldn't sleep well. A support system is important to every new parent, but even more so when babies arrive in sets. Lots of people will offer help, be sure to take them up on it. A few problems that creep up when trying to get or give help: 1) your forget who offered or what they offered and 2) you don't actually ask them to do anything. So keep a list of who offered and a list of what you need to be done. Anyone who comes over can help — you don't need baby holders usually. Meals, help with other children, a load of laundry, a trip to the store — this is what you'll most likely need. I'd also recommend a postpartum doula. This is someone who can help you figure out your new life at home. Multiples clubs can also be very helpful at navigating the twin waters. That said, I had a huge problem with my club being very different in parenting styles. So if you already have preconceived notions of how you want to parent, don't let that stop you from speaking up. There are other mothers with different philosophies. As I said, my twins were babies number five and six. I thought I knew a lot about parenting and I did. The problem was, I'd never had two babies at one time. That threw everything off. Some things aren't twice the work, they are less, but other things are more than twice the workload. Be easy with yourself; know that you will survive. Take lots of pictures, call out for help. Ask a close friend, before you have the babies, to mark on her calendar to bring your lunch and just sit to chat once a week or month — whichever works for you. Try to get out of the house every few days, with or without the babies. And take a shower daily! These survival tips are essentials. Baby care is basically the same for twins. Many moms worry about schedules and how to manage twins. For the most part, you can only do so much scheduling. Gentle nudges in certain directions can be helpful, but don't be rigid. For example, if Baby A wakes up to eat, go ahead and feed Baby B, if they'll let you. This might reduce the time before you have to get up again, but not always. Befriend the cat nap, let the house go, and snuggle your babies. The first year is a complete blur, hence the recommendation for a lot of photos, but it's so worth it.